Any time I hear something regarding “hair growth” or “hair loss prevention” I am immediately intrigued, especially if it is natural. Research shows that an Iodine deficiency may be a contribution to hair loss and why some can’t grow their hair as long as they want to. It is clear that the micro-nutrient iodine (And iron, magnesium and zinc) is a key essential element for the normal growth and development in all of the body’s organ and tissue systems. Iodine in combination with the aforementioned minerals is often considered the best “hair growth minerals” you can take for healthy hair. Some say it is “a natural element that helps hair growth miraculously." If you are currently experiencing hair loss, it may be a good idea to supplement with these, as hair loss can be one of the most common signs of a deficiency in iodine. Iodine deficiency is a common cause of hair loss that many people do not realize is behind the trauma. Iodine deficiency is a very started when the food industry replaced iodine with bromine about 40 years back. Bromine is a processed food enhancer, widely used today in pastas, cookies, breads and other bakery items. Iodine, when combined with iron, zinc and magnesium is said to be one of the best minerals that help in maintaining healthy and lustrous hair. The thyroid gland relies on iodine to make the hormones necessary for the growth of healthy hair, teeth and bones. When we are deficient in this nutrient, the health of our hair can suffer, leading to hair weakness or total hair loss. In order to avoid hair loss, you need to fulfill the iodine requirement of your body. If your body is deficient of iodine, it can cause hypothyroidism. In hypothyroidism, the cell metabolism in our body slows down, thus reducing the energy received by the hair cells to function properly. Deficiency of iodine may not only make you shed hair on head but also on eyebrows. Taking a safe nascent iodine supplement may boost hair health and growth, and may event prevent or reverse hair loss. Iodine has the ability to restore hair by killing off fungus which eats the end of hair follicles and also contains some potent antiparasitic, antiviral and antibacterial properties which helps maintain the health of your scalp. Iodine also stimulates the thyroid which helps in boosting your hair growth and maintains its strength. Because of its antibacterial and anti-parasitic properties, it also helps to fight infection on your scalp, which clears the follicles and roots. This automatically makes way for hair to grow on a fast pace. Iodine also prevents dry hair, hair loss and hair greying problem. Iodine makes your hair thick and strengthens them from roots. Historically, farmers understood the relationship between iodine and the health of an animal's coat. Sheep farmers noticed that iodine-poor soils produced iodine-deficient plants, which produced iodine-deficient sheep. These sheep, consequently, produced the least amount (and poorest quality) of wool. It stands to reason that human beings are just as affected by iodine-poor soil and plants as animals are. And hair loss may be related to this decline.Iodine is a key element for hair strength and growth. While we may get some synthetic iodine in table salt, our body has a hard time assimilating it. Taking a nascent, vegetarian form of iodine may prevent or reverse hair loss. There are a few studies that support this evidence. One 2001 study published in the Indian Journal of Dermatology, Venereology, and Leprology described the use of iodine as a treatment for patients with alopecia (hair loss), and found hair re-growth in a number of patients. 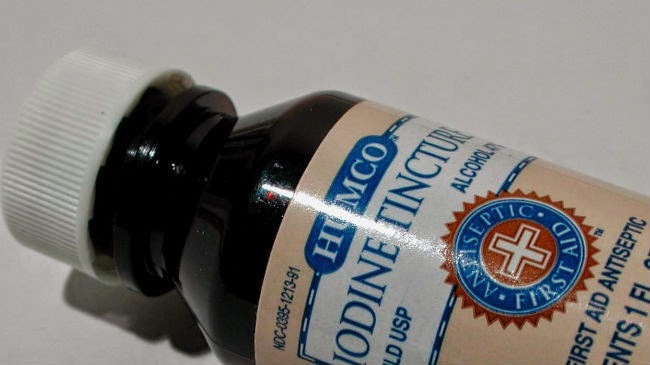 Try a high-quality, nascent iodine supplement, such as Detoxadine. This form of nascent iodine provides you with the recommended daily allowance of iodine in a bio-elemental nanocolloidal state. It is extremely important that you consume the correct amount of iodine. Excessive consumption of iodine can be dangerous. It decreases the flow of blood and hinders the growth of thyroid gland. It may turn toxic if used too often. Consult your doctor to determine the correct amount of iodine for you. Have you tried one of these Iodine solutions? Note: Always check with your doctor before taking any new supplement or vitamin. To boost up your hair growth and prevent hair loss, it is advised to intake iodine supplement for 3 to 4 days. Then, stop consumption for next 4 days and after that, start again. This regime follows the body’s natural cycle. So, in order to repair and heal, the body requires rest. The break of 4 days in between should enhance the effects of iodine. The amount of iodine to be consumed may vary from person to person. What supplements do you take for hair growth?